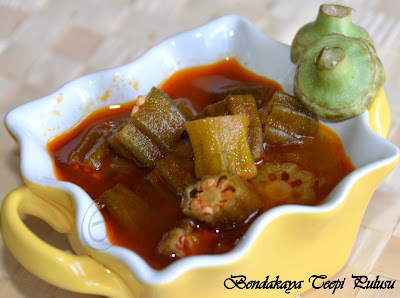 Bendakaya/ Okara is our all time favorite vegetable. We like it in every form, fry, curry with tomato, pulusu, stuffed (u get the gist). 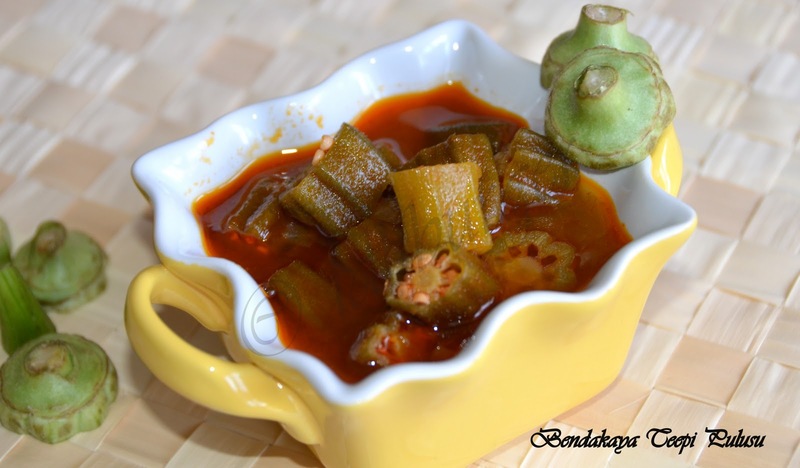 Bendakaya/Okara pulusu is a simple yet tasty recipe from Andhra. Okra is cooked with some jaggery to cut down the tanginess from the tamarind. Heat oil in a pan and then add the curry leaves. Add the chopped chillies and diced onion and fry till the onion turn translucent. Add the chopped okra, salt, turmeric pwd and red chilly pwd and combine. Close the lid and let simmer for about 8 mins. Then add the tamarind extract and jaggery. Combine. Add some water (if the tamrind extract is thin, there is no need to add the water). Cover with lid and simmer till the sauce thickens or till the okra is cooked through..
Switch off and serve with white rice. Nice curry. yummy with rice and chapathi too.